Register Now | Forgot Password? | Need Online Help? Manage your account anytime, anywhere. Bank on your schedule. 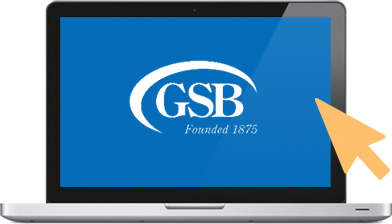 With GSB's online banking, you can pay bills, open accounts, view statements, and transfer money between accounts—whenever you want. It's free, it's secure, it's fast, and it's available anytime you need it, wherever you are. Manage your accounts with the convenience and security of free E-Line online banking. A secure, convenient way to send money to friends and family. Pay your bills anytime - 24 hours a day, 7 days a week - all from right inside Online Banking. Use our app to deposit checks for free, without ever coming to the bank. Go green and save paper with secure online statements. View all your outside financial accounts in one place, with one password. Prepare your tax return with an easy, step-by-step guide. There's even special help for first-time users. Check your balance and recent transactions without logging into the app. Sign up for free text message alerts to be notified of your financial activity. Need help deciding which account is right for you? Our Product Selector Tool helps you find the best match. By answering a few simple questions, we'll determine which account fits your unique goals. Thank you for submitting your "My Favorites" List. A GSB representative will contact you shortly. Enter your information below to send your "My Favorites" list to a GSB representative. After the message is sent, you will receive a confirmation email and a GSB representative will contact you shortly. Your "My Favorites" list has been sent to your email address. Please let us know when it's convenient to contact you by completing the form below. We look forward to discussing your business banking needs. How many employees does your business have? Preferable day to be contacted? Preferable time to be contacted? Thankyou for submitting your information. A GSB lending Represenative will contact you Shortly.